Outgoing DNC Chair Debbie Wasserman Schultz may not be feeling much love from Democrats at the Democratic National Convention, but here at American Crossroads we feel tremendous gratitude for Wasserman Schultz’s record at the helm of the Democratic Party. “One year ago Hillary Clinton endorsed President Obama’s ban on military-grade tactical equipment for those on the front lines fighting terrorism—our police—and yesterday she was gushing about the very protective gear she had vowed to restrict when pandering to anti-police groups. Looks like it’s time for Hillary Clinton to retire Madeleine “Not-Too-Bright” Albright from the surrogate circuit. First, Albright said there was a “special place in hell” for women that don’t support Crooked Hillary. This raises the obvious question: does former Secretary of State Albright remember that the rules that Crooked Hillary violated were put in place to safeguard sensitive and classified information that could compromise U.S. security and intelligence assets, thereby putting lives at risk? Did you happen to catch Hillary Clinton’s press conference on veterans’ issues? Oh, that’s right, she hasn’t had one of those since 2015. Instead, Hillary hides behind her staff that sends out emails highlighting her veterans’ “plan” and offers a sanitized version of her record on veterans’ issues. “Congresswoman and DNC Chairwoman Debbie Wasserman Schultz has played a critical role over the past several years in the massive Republican gains we have achieved at the state level, in the U.S. House of Representatives, and in the U.S. Senate. “Wasserman Schultz’s leadership has also been a catalyst for the emerging civil war in the Democratic Party this year, ensuring that their nominating process will drag on far longer than that of Republicans. Last week the Washington Free Beacon highlighted Nasser Al-Rashid, a key advisor to the Saudi royal family who donated between $1 million and $5 million to the Clinton Foundation. The Free Beacon also reported on how Al-Rashid’s sons have donated hundreds of thousands to Democrat candidates, committees, and Super PACs over the past six years (with most of the money benefitting Florida’s Patrick Murphy). Once again, this raises the very important question – If Hillary Clinton is really concerned with the advancement of women not named Hillary Clinton, why did her foundation take money from regimes and an individual with such a horrible history when it comes to the treatment of women? Will Debbie Wasserman Schultz return domestic violence-linked cash? Over the past few weeks, people have gotten to know the name Ibrahim Al -Rashid. The son of a Saudi billionaire and the second biggest backer of Patrick Murphy’s improbable rise has caused problems for Democrats across the country as they have had to give away thousands donated to them due to this domestic violence incident by Al-Rashid. Thus far Privileged Patrick Murphy, Joe Garcia, Josh Gottenheimer, andSenate Majority PAC have all gotten rid of Al-Rashid’s cash. While Murphy hasn’t agreed to donate to charity the $100K Al-Rashid gave to the 2012 Super PAC run by his dad, he claims to have rid himself of all Al-Rashid cash to his campaign as far back as 2011 (we remain dubious). So if we take Privileged Patrick at his word that he has returned even pre-incident donations, we have to ask – will Debbie Wasserman Schultz return the max out donation she received from Al-Rashid? After all, Wasserman Schultz has been quick to use the divisive “war on women” rhetoric over the years. Will she show that she is serious about combatting violence against women by donating Al-Rashid’s campaign cash to a charity? And while we’re at it, will Ted Deutch and Frederica Wilson, who received large donations THIS CYCLE, be ridding themselves of that tainted cash? ICYMI, Bloomberg is reporting that the Clinton gang is trying to distract from news of her mounting legal quagmire by smearing non-partisan government employees at the State Department Inspector General’s office. This comes just a few weeks after the Clinton gang tried to smear the non-partisan Inspector General of the Intelligence Community. Where have we seen this “smear the career government employee” play before? Oh yeah, Travelgate. You know, the controversy where Hillary wanted to privatize the White House travel office and give her campaign donors the contract? And to prevent blowback from firing seven non-partisan government employees, the Clinton gang brought the full weight of the justice department to prosecute Billy Ray Dale, the head of the travel office, for embezzlement. Dale was acquitted in under two hours, and it was Hillary who, in the subsequent investigation into her role in the firings, was found to have made false statements under oath. So here we are again – the Clinton gang railroading career, non-partisan government employees for political gain. “To quote Aerosmith, when it comes to Hillary Clinton throughout the decades ‘it’s the same old story, same old song and dance.’ When she finds herself in trouble, she targets innocent people and railroads them. Last night was not a particularly good one for Hillary Clinton. Not only was she grilled on why she wouldn’t release her paid speeches at a Nevada town hall, but in an interview with CBS News’ Scott Pelley, Hillary could not definitively say that she has not and would not lie to the American people. Instead, she said she tries not to lie. Look at the video. Look at the body language from Clinton – does that look like the body language of someone who is telling the truth about her own capacity to tell the truth? In the words of a wise green puppet from Dagobah, “do or do not, there is no try.” Well, when it comes to a president telling the truth to the American people, there is no TRY Hillary – you either do tell the truth or you do not. If you can’t give that guarantee, apply for a different job. Is there anything that Hillary Clinton won’t lie about in an effort to get votes? Remember her pointless lie about trying to join the Marines? Well, she’s at it again. Today, speaking at an event in Chicago, Hillary told a nice little story about how her dad was a Republican and the two would get in arguments at the dinner table when she was in high school. Of course, the problem here is that when Hillary was in High School she was a Republican. At 13 years old, she enthusiastically canvassed for Richard Nixon in the 1960 race against JFK. 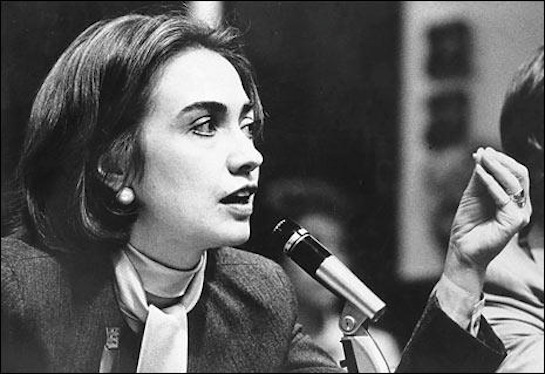 In 1964, a 17 year oldHillary volunteered for Barry Goldwater. Once in college, she became President of the Young Republicans and even attended the 1968 Republican Convention. So either Hillary was telling yet another lie, or she had some serious dinner table arguments about who was more conservative. I don’t know about you, but I’m old enough to remember a debate when Hillary Clinton attacked Bernie Sanders for saying that Barack Obama hasn’t done enough to bridge the divide between Americans and Congress. So it stands to reason that Hillary should now have to answer for the same criticism of Obama from her husband Bill, who told a crowd in Memphis last night that Obama wasn’t a “changemaker” who was able to get Congress to work with him. What’s next? Is Bill going to go all 2008 and say that the whole Obama presidency was just a big fairy tale? But in talking about the struggles of middle- and lower-class America, Clinton was met with silence when he said President Barack Obama wasn’t a “change-maker” like Hillary. He clarified a few sentences later that Obama has had accomplishments, including the Affordable Care Act. Is Harry Reid getting sick of Hillary Clinton? Harry Reid must really be getting sick of Hillary Clinton and her desperate tactics. First, in an ironic response to Bernie Sanders’ attacks on her for being too cozy with Wall Street, Hillary threw the Democratic Senatorial Campaign Committee and all its candidates under the bus for, get this, being too cozy with Wall Street. Now, Hillary’s campaign team has stopped hiding under their desks in Brooklyn long enough to spin a yarn about how Nevada isn’t any more diverse than Iowa and New Hampshire. Meanwhile, Harry Reid has been making the case that Nevada should have more of a role in picking the Democrats’ presidential nominee BECAUSE it is more diverse than Iowa and New Hampshire. We can’t imagine Reid is particularly happy about Hillary’s contradictory tactics. We already know Jon Ralston isn’t. A few weeks ago American Crossroads purchased some real estate in Hillary Clinton’s head by launching a digital ad in Iowa entitled “Hillary’s Bull Market.” To our immense pleasure, she’s been talking about it ever since, including once again at last night’s debate. Hillary is mentioning the ad because she is desperately trying to make the case that our focus on her is because she’ll be tougher on Wall Street. No one’s buying it. If Hillary really wants to prove that she is not just a Ward of Wall Street, she’ll release transcripts of her paid speeches. After all, if she can’t be influenced by money, certainly her three $225K speeches to Goldman Sachs will sound just like the anti-Wall Street speeches that she has been giving on the campaign trail. Now that Chelsea Clinton has joined the political fray and launched harsh attacks on Bernie Sanders, she should be held to the same level of scrutiny as any other politician. The word “dismantle” insinuates that Sanders wants to eliminate those programs, which is false. However misguided Sanders’ plan is, the truth is he wants to consolidate all those programs into one big government program of nationalized health care. Would Hillary revoke Bill Cosby’s Medal of Freedom award? Last week the Washington Post reported that Congress is considering passing a law that would allow President Obama or his successor to revoke Bill Cosby’s Medal of Freedom, in light of the multiple allegations of sexual assault being made against him. Previously, Promoting Awareness Victim Empowerment advocated for the use of executive order authority to revoke the medal, with the support of Sens. Kirsten Gillibrand (D-N.Y.) and Claire McCaskill (D-Mo.). (1) Does Hillary believe that Bill Cosby’s Medal of Freedom should be revoked? (2) If elected president, would Hillary wait for Congress to pass a law giving her the power to revoke Cosby’s medal, or would she simply do it by executive order? Remember when we suggested that Patrick Murphy was buying endorsements with Mom and Dad’s money? Check it out here. Well, that trend continues with a big endorsement from the “progressive” camp: Al Franken. Patrick’s dad Thomas and his mom Leslie each gave Franken the maximum of $5200 in 2014. So why would the Murphys (both business-oriented Republicans) give a far left-wing Senator from Minnesota $10,400? Two options: (1) they are big fans of Stuart Smalley, or (2) they were strategically giving money to politicians they knew would be needed when their son ran for the Senate. We’re gonna go with option 2. Patrick Murphy is having a rough day – first the Progressive Democrats of Florida accuse him of being on the take, now it looks like his endorsement by Al Franken was purchased with his parents’ campaign cash. It’s enough to make one wonder what else people will find if they start looking a little closer at Murphy’s sudden rise from obscurity to U.S. Senate candidate. Is Patrick Murphy legislating under the influence? Today the Progressive Democrats of Florida swung hard at Patrick Murphy and accused him of improper influence. Specifically, they noted that Murphy initially supported the All Aboard Florida high-speed rail project but changed his tune when his family business Coastal Construction was not selected as general contractor of the project. This is a pretty strong accusation that implies that Murphy is legislating under the influence of his family’s powerful construction company – one that also has donated big money to his campaign and Super PAC. Patrick Murphy has gotten a free pass from most of the media during his fledgling political career. But if they gave his record the scrutiny that most politicians receive, they would see a pattern of conflicts of interest and influence-peddling that underlie his sudden rise from obscurity to U.S. Senate candidate. Jason Kander (or the Democratic Senatorial Campaign Committee operative running his campaign from a Washington D.C. basement) sure does seem to enjoy maliciously using last week’s terrorist attack to falsely attack Senator Blunt. But what’s good for the goose is good for the . . . Kander. So maybe someone should ask Kander why, as a member of the Missouri legislature, he voted against a resolution urging Congress to reject transporting detainees from GITMO to Missouri. Especially, in light of today’s news that a former GITMO prisoner just showed up in the latest video released this week by Al Qaeda in the Arabian Peninsula. And what is Kander’s plan for defeating ISIS? Does he think Obama is doing enough? Did he like Obama’s Sunday night lecture to the nation? Does he agree with Hillary Clinton that the fight against ISIS is not America’s fight? Is he, like Hillary, unwilling to say that we are at war with ISIS? WASHINGTON – Today, American Crossroads released the results of its monthly Vox Populi battleground state tracking poll showing that Hillary Clinton continues to lose ground to a generic Republican. In an online poll of registered voters in Colorado, Florida, Iowa, Nevada, Ohio and Virginia, Clinton trails a generic Republican nominee by 35% to 54%; down from November’s poll when she trailed 40% to 52%. The poll also found that 55% of respondents were less likely to vote for Clinton because of her support for continuing to accept Syrian refugees following the Paris attacks. Similarly damaging is the ongoing FBI investigation into possible Espionage Act violations arising from her use of a private email server – 56% of those surveyed are less likely to vote for her as a result. The December poll can be viewed here, and the full trends from our monthly polls can be accessed here. As the attack on the U.S. consulate in Benghazi was unfolding, a high-ranking Pentagon official urgently messaged Secretary of State Hillary Clinton’s top deputies to offer military help, according to an email obtained by Judicial Watch. The revelation appears to contradict testimony Defense Secretary Leon Panetta gave lawmakers in 2013, when he said there was no time to get forces to the scene in Libya, where four Americans were killed, including U.S. Ambassador to Libya Christopher Stevens. The email was sent out at 7:19 p.m. ET on Sept. 11, 2012, in the early stages of the eight-hour siege that also claimed the lives of Foreign Service Information Management Officer Sean Smith and two former Navy SEALs, Ty Woods and Glen Doherty, private CIA contractors who raced to the aid of embattled State Department workers. Although the email came after the first wave of the attack at the consulate, it occurred before a mortar strike on the CIA annex killed Woods and Doherty. “This leaves no doubt military assets were offered and ready to go, and awaiting State Department signoff, which did not come,” Judicial Watch, a nonprofit government watchdog said in a statement. Parts of the email from Bash were redacted before release, including details on what military forces were available. The first assault occurred at the consulate at 3:40 p.m. ET. The second attack on the CIA annex a little over a mile away began three hours later. Bash’s email was sent approximately 40 minutes after that attack began. Bash’s email, which bore the subject line “Libya,” was sent to Clinton’s then-deputy chief of staff Jacob Sullivan, Deputy Secretary of State for Political Affairs Wendy Sherman and Deputy Secretary of State for Management and Resources Thomas Nides. The attack came in three waves at two locations. It began when a handful of attackers scaled the wall of the diplomatic post at dusk and opened a gate, allowing dozens of armed men inside who then set the building on fire. Stevens and Smith died after breathing in smoke while hiding in a safe room, and later died. Hours later, a nearby CIA annex was attacked twice. Woods and Doherty died there while defending the annex from the rooftop. A team of six security officials summoned from Tripoli and a Libyan military unit helped evacuate the remaining U.S. personnel who were taken to an airport and flown out of Benghazi. The Obama administration later falsely claimed that the attack was triggered by an Internet video that insulted Islam. 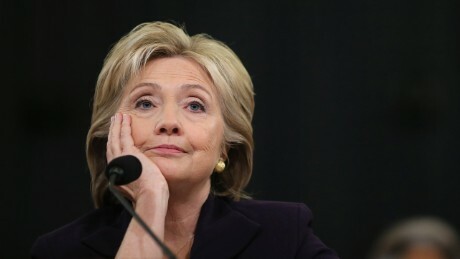 Lawmakers investigating the events surrounding Benghazi already had acquired the e-mail, along with tens of thousands of others related to the probe, according to Matt Wolking, spokesman for the House Select Committee on Benghazi. Last week, America suffered its most deadly terror attack since 9/11. Since then, Ohio Senate candidate Ted Strickland has said NOTHING publicly about that attack or the larger question of national security. Not on Facebook, not on Twitter, not on his website. Sounds like the tag line for a political ad – Ted Strickland, too busy fundraising to talk about national security. “President Obama is playing defense, not offense: defending his ineffective policies instead of adopting a new offensive strategy to decisively destroy ISIS. And other than a few rhetorical flourishes, Hillary Clinton’s position is essentially the same: clinging to their weak policies that have made us and the world less safe. Hillary Rodham Clinton will spend the next twelve months in the Granite State, faking a New Hampshire accent and telling voters that she is one of them. Today, however, she will be collecting #Deflategate cash at the Manhattan law firm that collected millions to get laughed out of Federal Court for the NFL’s bogus witch hunt of Tom Brady. Here is our challenge to Hillary Clinton – cancel the #Deflategate fundraiser and prove to New Hampshire voters that she won’t stand for wasting taxpayer dollars on ill-conceived witch hunts. (1) Hillary Clinton has criticized Republicans for wanting to halt the influx of Syrian refugees. Does that harsh criticism also apply to Democrats who have taken a similar position such as New Hampshire Governor and Senate candidate Maggie Hassan, Ohio Senate candidate Ted Strickland, and Nevada Senate candidate Catherine Cortez Masto? (2) Leaders take responsibility for their mistakes. Given that Hillary was a lead proponent of the strategy to effect regime change in Libya, will she admit any mistakes in a strategy that has led to chaos, lawlessness, and ISIS gaining a strong foothold in the country? (3) Hillary justifies intervention in Libya based on the fact that Gadaffi was a tyrant that had American blood on his hands. However, Hillary warmly welcomed that tyrant’s son to the State Department in 2009 and only took a stance against the Gadaffi regime when it was politically expedient to do so. Was Hillary’s formerly pro-Gadaffi stance influenced by (A) the fact that major Clinton Foundation donors had significant business interests in Libya, and/or (B) that her first international energy envoy, David Goldwyn, had formerly served as executive director of the U.S.-Libya Business Association and had lobbied for new U.S. business deals with Gadaffi’s government? (4) Hillary Clinton was the chief architect of the Obama Administration’s “pivot” to Asia, which would counter China’s growing hegemony in the region. In fact, Clinton called it “among the most important diplomatic efforts of our time.” That effort has been a failure and the repercussions of that failure are a threat to the stability of the region. Looking back on the failure of the “pivot” to Asia, what would Hillary now do differently? (5) In 2013, Hillary wrote a memo to President Obama proposing to close GITMO and transfer terrorists. In that memo, she outlined a strategy for Obama to get around a requirement that the Secretary of Defense certify that transferred detainees would not engage in acts of terrorism. What was Hillary’s logic in advising Obama to end-around a certification that a GITMO detainee would not engage in acts of terrorism? As Hillary Rodham Clinton prepares to give a national security speech tomorrow, it is worth looking again at perhaps her biggest foreign policy failure – Libya. While initially Hillary and her close advisor Sidney Blumenthal thought that her Libya policy could be something to hang her hat on, those in the know – like former Secretary of Defense Robert Gates – said that Hillary was “playing it by ear” in Libya. But here is the question that more in the media need to start asking Hillary – Gaddafi was a murderous dictator well before Hillary became Secretary of State; so why did she so warmly welcome Mutassim Gaddafi, the Libyan tyrant’s son and national security adviser, to the State Department in April, 2009? Check out the video of Hillary’s meeting with Mutassim here. Could it be that Hillary’s warm welcome of Gaddafi was because, as the Washington Examiner reports, so many donors to the Clinton Foundation had business interests in Libya? This weekend, Patrick Murphy strongly endorsed the Obama/Clinton Doctrine of leading from behind in world affairs. Speaking at the “Democrat of the Year” luncheon in Boca Raton (video here) two days after the Paris attacks, Murphy praised Obama’s leadership even as other Democrats like Senator Diane Feinstein andCongressman Seth Moulton have criticized Obama’s weakness in taking on ISIS. (1) Is Murphy, like Obama, also not interested in “pursuing some notion of ‘American leadership’ or ‘America winning’”? (2) Does Murphy favor letting all the Syrian refugees in the country? (3) Does he agree with Senator Chris Murphy, who endorsed him, that the U.S. military is to blame for the rise of ISIS? Floridians deserve to know the answers to these questions. Yet Murphy appears to have gone radio-silent on Paris, ISIS, Syrian refugees or any other important national security issue. In fact, as of this email, there was no mention about any of those issues on either his official website, his campaign website, his official Twitter handle, or his campaign Twitter handle. Talk about leading from behind. Two months ago Patrick Murphy naively asserted that the Iran nuclear deal would bring ‘peace in our time.’ Now he is doubling down on the Obama/Clinton Doctrine of leading from behind. One thing is clear – in these increasingly dangerous times, Young Patrick Murphy is simply unqualified to be in the United States Senate. Yesterday, following a CNN report that Hillary Clinton once again claimed to have tried to join the Marines in 1975, we asked if the media would investigate that claim as vigorously as it did Ben Carson’s claim about being offered a scholarship at West Point. Will the media investigate Hillary’s claim about trying to join the Marines? Last week the media did a thorough investigation of Ben Carson’s claim that he was offered a scholarship to West Point. This week, per CNN, Hillary Clinton has revived an interesting anecdote about how a young, anti-war Hillary tried to join the Marines but was rejected. CNN also notes how this claim has been met with skepticism over the years. So what gives – is this story true as told, exaggerated, or is it another “we landed under sniper fire” lie from Hillary? I guess the only way we’ll find out is if the media is as dogged in its investigation into Hillary’s claim as it was investigating Carson’s. Did a bad poll cause Hillary’s 180 degree turn on VA scandal? Sometimes we have to wonder if Hillary Clinton was not actually born in Illinois, but built in the basement of a polling firm in Alexandria, VA. The latest evidence of that theory comes a little over two weeks after Hillary said that Republicans were overstating the Department of Veterans Affairs crisis in order to privatize the VA. Today, Hillary did a complete 180 and announced a plan to use private health care providers – which is amazingly the exact same plan proposed by Republican John McCain. So what happened here? Here’s our theory: Team Hillary poll tested her statement that the “VA problem was overblown.” We’ll go ahead and make an educated guess that approximately 60% of people surveyed said they were less likely to vote for her as a result. We’ll also go out on a limb and speculate that the poll showed that Sen. McCain’s plan to use private health care was viewed favorably. Therefore, Hillary adopted it as her own. At today’s Hillary Clinton campaign event in New Hampshire, a supporter told Hillary that every time he sees Fiorina on TV, he wants to reach in and “strangle” her. As a self-styled advocate for protecting women, no doubt Hillary told the man that his comment was out of bounds and inappropriate, right? Nope. Click here for the relevant exchange or click on the picture for the full video. Seems like it wasn’t too long ago that the media went after Donald Trump for similarly not standing up to a supporter. Will Hillary get the same treatment? We’re not holding our breath. This exchange says all you need to know about Hillary Clinton. She loves to play the ‘war on women’ card when it helps her get votes. But when she stands to lose a single voter by condemning his comment about ‘strangling’ a women, Hillary is more than happy to go right along with his tasteless and inappropriate joke. In almost every democracy in the world, political parties who lose landslide elections respond by deposing their leaders and conducting autopsies on their strategies. But Senate Democrats, routed in 2014, have instead doubled down on failure and that’s why they will fail, and Republicans will win again in 2016. In 2014, voters deliberately fired Democrats – with cause – from control of the United States Senate. Americans were fed up with years of inactivity and dysfunction, and said enough is enough. But losing the Senate majority was just the latest in a long line of electoral defeats for Democrats. Since President Obama took office, Democrats have been decimated at every level, from the Senate to state legislatures. Since 2008, they have lost 13 Senate seats, 69 congressional seats, and over 900 state legislative seats. The American people are not buying what Democrats are selling. One year out from Election Day 2016, it’s clear that Democrats have learned nothing from the last eight years. Despite years of rejection, Democrats are offering voters more of the same in 2016. They are running the same old, tired, campaigns. They are not recruiting unique, different candidates. To the contrary, all of their top recruits look an awful lot like the crop that voters threw out in 2014. Take the battleground states of Wisconsin and Ohio. Democrats’ so-called prize recruits are both retreads who voters have already rejected. Furthermore, Democrats have bruising, costly primaries in at least four key states. They failed to recruit a top tier candidate in North Carolina and don’t have a credible candidate in Iowa, a state Barack Obama won – twice. If the DSCC manages to pull all of their endorsed candidates into the general, they will arrive badly damaged. If they don’t, they will be stuck with candidates like Joe Sestak and Alan Grayson, who they have already deemed unelectable. The few policy ideas they are promoting are stale and outdated. Their signature policy item from 2015 has been the disastrous Iranian nuclear deal that Americans do not support and fear will make us less safe. This tone-deafness strikes a similar chord to another recent experience: Every Democratic senator who crafted Obamacare lost re-election or chose to resign instead of facing their fate at the ballot box. Republicans will maintain control of the Senate because we have better-prepared candidates running better, more coherent, and more thoughtful campaigns. We have studied both parties’ successes and failures over the last several cycles. We have learned from our mistakes, improved our strengths and looked out new, innovative ways to reach voters. The same cannot be said for our friends across the aisle. Democrats lost in North Carolina, Colorado, Alaska, and Louisiana last year because they ran the same campaigns they have run for years. Voters have grown tired of their malicious, dishonest campaigns. But Democrats clearly learned nothing because they are running the exact same campaigns in 2016 they did in 2014. Republicans will not make the same mistake in 2016. Despite our electoral successes in 2014, we have thrown everything out and started over from scratch. Every Republican campaign this cycle will be at the very forefront of technology and innovation in critical areas such as digital outreach and voter contact. Make no mistake about it; Republicans have our work cut out for us. Fortunately, we have been blessed with great candidates who do an excellent job representing their constituents. But we’re taking nothing for granted and we’re making sure they have every tool they need to be successful. In 2014, Republicans ran on a promise to get the Senate working again. Leader McConnell (R-Ky.) and the entire Republican caucus have delivered on that promise, and will continue to do so. One year in, the Republican majority is off to a productive start, but there is much more work to be done. We understand nothing will be handed to us. That is why we have spent the last year relentlessly recruiting candidates, building sophisticated campaigns and raising the resources needed to win. We’re ready for the challenges ahead of us over the coming year, and on Election Day, Republicans will again hold the majority in the United States Senate. Baker is executive director of the National Republican Senatorial Campaign (NRSC). NBC may not have covered itself in glory with last week’s GOP debate debacle, but at least America can count on NBC News to give Hillary Clinton equally tough treatment, as evidenced by this hard hitting piece on the eating habits of her campaign staff. Leaving no stone unturned, NBC News revealed that Hillary Clinton’s staffers spent 66.2% of its food spending on pizza, compared to only 21.1% on subs and 11.2% on donuts. Frankly, we haven’t seen an investigation this thorough since Rollo the Janitor discovered that Billy Madison likes soda. Yet, as Jennifer Rubin of the Washington Post notes, it hasn’t been all puff pieces and pizza parties for Hillary despite the media coverage. Rather, recent polls show that the “Clinton comeback story” is largely a media creation and that she still is seen as untrustworthy and unlikeable by independents. But let’s all keep our eyes on the important things – like pizza. While the mainstream media pushes the fictional ‘Hillary comeback’ narrative with puff pieces and pizza profiles, the truth is that the more Americans see and hear Hillary Clinton, the more likely they are to not trust her, not like her, and want somebody else. After Ted Strickland took his ‘dream job’ lobbying for a liberal Washington think tank, he came back to Ohio transformed into a partisan liberal with a mean streak and an enemies list. The last thing Ohio needs is a Senator adding to the partisan gridlock in Washington and attacking people as enemies because they don’t share his liberal values. So, according to Cortez Masto, “protecting Harry Reid’s seat” is more important than jobs for Nevadans, national security, or education. We checked a recent Gallup poll and shockingly did not find “protecting Harry Reid’s seat” anywhere on the list of issues that are important to people. All of this reminds of us of another Senate election in which an underwhelming Attorney General suffered a humiliating defeat in her run to “protect” a longtime Senator’s seat. We’re talking of course about Martha Coakley (coincidentally a Cortez Masto donor) and her embarrassing defeat against Scott Brown in the 2010 Massachusetts Senate special election. Brown was able to turn the “protecting Ted Kennedy’s seat” attitude from Coakley and Democrats into serious political points for himself with this great exchange. Remember when Patrick Murphy backed “across the board” “structural reforms” to Social Security, Medicare, and Medicaid that would also entail cuts to those programs? We do – and it’s all on video right herewhen Murphy sat down for an interview with CNN back on January 2, 2013. Of course, now that Murphy’s running in a Democratic primary, he’s following Alan Grayson’s liberal lead like a lost puppy. Just last weekAlan Grayson called for an increase to Social Security benefits, despite the program’s financial difficulties. Predictably, Murphy then released a statement saying he wanted to increase benefits too and sent a laughable fundraising email criticizing Majority Leader Mitch McConnell for wanting to “reform” Social Security and Medicare. The question Democratic primary voters have to ask is which Patrick Murphy would they get in the Senate? The 2013 Murphy that backed McConnell-style reforms to entitlements, or the 2015 Murphy that will say anything to get elected? Yesterday Florida Senate candidate Patrick Murphy continued his desperate lurch to the left and formally came out in opposition to the Trans-Pacific Partnership (TPP) deal. Murphy cited environmental concerns and the need to “level the playing field” for Florida businesses. Yet Coastal Construction, owned in part by Patrick Murphy, wasn’t focused on using environmentally safe American products when it was importing Chinese Drywall to build homes in South Florida, leading to a multi-district class action lawsuit. So…if it helps ex-Republican Murphy win in a Democratic primary, he’s against free trade. If it puts cash in his family’s pocket, he’s for it—even if it hurts Florida businesses, families and the environment. WASHINGTON – Today, as Democrats kick off the first of six debates, American Crossroads released the results of its monthly Vox Populi tracking poll, showing continued deterioration in Hillary Clinton’s image and weak performances by both Clinton and Joe Biden against a generic Republican nominee in six key battleground states. In an online poll of registered voters in Colorado, Florida, Iowa, Nevada, Ohio and Virginia, Clinton trails a generic Republican nominee by 36% to 50%, while Biden gets 36% to 48% for a generic Republican. Last week we predicted that Hillary Clinton’s visit to Patrick Murphy’s neighborhood may result in her endorsing Murphy. After all, Clinton has endorsed the DSCC-approved candidates in the Ohio and Illinois Senate primaries AND Murphy’s parents have donated big money to Hillary’s campaigns, a strategy that has helped young Murphy’s fortunes in the past. But according to progressive blogger Howie Klein and Nancy Smith of the Sunshine State News, Hillary not only didn’t endorse Murphy, but she didn’t acknowledge his presence at a Broward rally and even barred him from entering her fundraiser. What does it say that Hillary Clinton not only failed to endorse Patrick Murphy, but wouldn’t let him into her fundraiser or acknowledge him at her campaign rally? It says that Hillary wants no part of the guy who is going to finish second to Alan Grayson in the Democratic Senate Primary. Hillary Clinton Set to Endorse Patrick Murphy? Today, Hillary Clinton is heading to Patrick “Silver Spoon” Murphy’s South Florida neighborhood and it stands to reason that an endorsement of Murphy should follow. After all, Hillary’s endorsement has followed the DSCC’s backing in contested primaries in both Illinois and Ohio. Add to that the fact that Patrick Murphy’s parents have given big money to Hillary Clinton over the years. Patrick’s father Thomas gave $4000 to her 2006 Senate campaign, $2300 to her 2007 Presidential campaign, and $2700 to her 2016 Presidential campaign. Patrick’s mother Leslie also gave $1000 to Hillary’s 2006 Senate campaign, $2300 to her 2007 Presidential campaign, and $2700 to her 2016 Presidential campaign. And if there’s one pattern we’ve seen it’s that endorsements of young Patrick usually aren’t far behind his parents campaign checks. Hillary Clinton has willingly inserted herself into Senate primaries in Ohio and Illinois and backed the candidate with the DSCC stamp of approval. If she lets her visit to Palm Beach go by without endorsing Patrick Murphy, whose parents are major donors to her campaigns, it would signal a serious lack of confidence in his chances to defeat Alan Grayson. Is Hillary Clinton joining national Democrats in showing “total insensitivity to Chicago, African-American women and the Democratic process”? That’s a question people should be asking after Hillary followed the DSCC’s lead and endorsed Tammy Duckworth over Andrea Zopp in the Illinois Democratic Primary for U.S. Senate. Zopp called out the DSCC for its endorsement, saying that it showed “total insensitivity to Chicago, African-American women and the democratic process.” Shortly thereafter, Jesse Jackson also slammed Senate Democrats for the slight. Shouldn’t the same criticisms levied at the DSCC by Zopp and Jackson also apply to Hillary Clinton? While Hillary courts the African-American community in her embattled primary, Hillary doesn’t give the time of day to a leading African-American woman running for the U.S. Senate in Hillary’s original home state. Yesterday we pointed out the interesting circumstance of young Patrick Murphy’s parents maxing out to federal members of Congress who just happened to have also been early endorsers of young Patrick in his race against Alan Grayson. “In June, Robert Strouse sent $5,200 to the campaign of U.S. Rep. Patrick Murphy (D., Fla.). (The Floridian is no relation to the former Bucks County congressman with the same name.) Four days later, Murphy’s father, Thomas P. Murphy Jr., sent an identical campaign contribution to Kevin Strouse. And how much did Murphy get from this swap scheme with the Strouses and Beras? At least $22,900. $5200 from Kevin Strouse’s father, $2300 from Strouse’s mother, $5200 from Ami Bera’s father, $5200 from Bera’s mother, & $5000 from Bera’s wife. Patrick ‘Silver Spoon’ Murphy proves over and over again that he’s willing to use his family’s millions to bend the rules for the sake of climbing the political ladder. $$$ for endorsements in Florida Senate Race? Ted Deutch: Thomas P. Murphy donated $4800 to Deutch in 2011 and $5400 to him in 2015. Patrick’s mother Leslie Murphy also donated $4800 to Deutch in 2011 and $5400 to him in 2015. Total $ from Patrick’s parents to his endorser Ted Deutch – $20,400. Alcee Hastings: Thomas P. Murphy donated $5000 to Hastings in 2011 and $5400 to him in 2015. Leslie Murphy also donated $1000 to Hastings in 2011 and $5400 to him in 2015. Total $ from Patrick’s parents to his endorser Alcee Hastings – $16,800. Frederica Wilson: Thomas P. Murphy donated $5400 to Wilson in 2015. Leslie Murphy also donated $5400 to Wilson in 2015. Total $ from Patrick’s parents to his endorser Frederica Wilson – $10,800. Alex Sink: Thomas P. Murphy donated $10,000 to the Alex Sink Victory Fund in 2014. Interestingly, Murphy’s parents donated in 2011 (when Patrick switched from Republican to Democrat and needed some D) friends, they skipped 2013 when Patrick didn’t have much of a race, then they came back to the table big time in 2015 when Patrick needed D friends again for a possible primary in his run for the Senate. One thing is abundantly clear here – young Patrick Murphy spends a lot of time bemoaning money in politics, but he sure has put his family’s millions to use trying to buy himself a political career. Last week we learned that Hillary Clinton did not turn over all of her work related emails, despite claiming to have done so under oath. When asked about it by Chuck Todd on Meet the Press, Clinton did her best to dip, dodge, duck, dive and dodge. “Hillary testimony was ‘factually false.’” – Rochester Sentinel, October 19, 2000. “Mr. Ray disclosed parts of Mrs. Clinton’s 1995 deposition he now says are demonstrably false.” – NY Times, October 19, 2000. “There is ‘substantial evidence’that First Lady Hillary Rodham Clinton lied under oath in denying that she played a role in the 1993 White House travel office firings, independent counsel Robert W. Ray reported Thursday.” – LA Times, June 23, 2000. “Americans of all political persuasions are coming to the sad realization that [Hillary Clinton] — a woman of undoubted talents who was a role model for many in her generation — is a congenital liar.” – NY Times, January 8, 1996. Perhaps it might be time to stop counting how many times Hillary has lied, and start the easier task of counting how many times she hasn’t. Young Patrick Murphy has been more follower than leader in his unremarkable career as a politician, but perhaps now that he is trying to pander to his base there is an issue on which he can take a stand – the Democrats’ growing debate problem. Specifically, Murphy can join other liberals and activists (and even Nancy Pelosi) and demand that DNC Chairwoman Debbie Wasserman Schultz schedule more debates. And if Murphy agrees with Wasserman Schultz that Democrats should have the fewest primary debates since 1980 and twenty less than they did in 2008, he needs to explain to Florida’s Democratic primary voters exactly why he thinks so. Either way, it’s time for Murphy to take a stand – otherwise, he might find himself following the lead of Alan Grayson in more than just the polls. In this post on TMZ yesterday, Hillary Clinton was asked about which woman she thinks should be on the 10-dollar bill. What happened next was pure Hillary. First, she accused the Republican field of not being able to name a single American woman for the honor. Well, any of the 23 million people who watched last week’s debate would know that’s another Hillary lie. Then, when pressed on who Hillary thought should be on the 10-dollar bill, she claimed to have a “long list,” but couldn’t name a single woman – not one. Another day, another Hillary lie, another Hillary backfire – we’ve got binders full of them. Is Catherine Cortez Masto Waiting for Biden? Or Waiting for Reid? With just three weeks until the first Democratic Primary Debate in Nevada, Harry Reid’s handpicked Senate candidate Catherine Cortez Masto still isn’t willing to endorse Hillary Clinton. Compare this with numerous other members of Congress and Senate candidates who have endorsed Clinton as early as January. Is it because Cortez Masto is going to join the socialist revolution of Bernie Sanders? Maybe she thinks that Lincoln Chafee’s plan for the metric system can turn Nevada’s economy around? Or is Cortez Masto simply waiting for Biden? While we can’t say for sure who she will endorse, there is one thing you can take to the bank – Cortez Masto will follow her “lead from behind” strategy on the Iran deal and won’t make an endorsement until Harry Reid does it first. WASHINGTON – As Hillary Clinton tries a new apology strategy to put her email scandal in the rearview mirror, today American Crossroads welcomed Hillary Clinton back to New Hampshire with a digital ad entitled “Orange is the New Black.” The ad uses footage from Hillary Clinton’s infamous August 18th press conference in Las Vegas. The new ad is part of a targeted online buy that began in Iowa on Monday. The spot can be viewed here. Yet in an interview yesterday with Jon Ralston, Cortez Masto was unable to name a single concern she had with the deal. Instead she shifted into “generic talking points mode” and used the phrase “move forward” as many times as possible in hopes that Ralston would “move forward” to an easier question. Check out her frighteningly incoherent and rambling non-answer above. WASHINGTON – As Hillary Clinton tries a new apology strategy to put her email scandal in the rearview mirror, today American Crossroads began a new online campaign in Iowa with a digital ad entitled “Orange is the New Black.” The ad uses footage from Hillary Clinton’s infamous August 18th press conference in Las Vegas. The new ad is part of a targeted online buy initially focused on Iowa beginning on Monday, September 14. The spot can be viewed here. WASHINGTON – Today, American Crossroads released the results of its monthly Vox Populi tracking poll showing that Hillary Clinton continues to trail a generic Republican nominee in six key battleground states by double digits (52%-39%). The poll also shows that Clinton’s unfavorables remain at 57%, but that her favorables have declined from 36% to 32% from last month’s poll (Clinton now stands at 32% favorable/57% unfavorable). -54% are less likely to support Clinton because of her unauthorized use of unsecure email to transmit classified information while serving as Secretary of State. The poll can be viewed here.